Mort Künstler Hand Signed and Numbered Limited Edition Print :"Capitol Farewell"
Edition Size: Artist Signed and Numbered with COA to 350 prints (Sold Out) with 50 AP's on Paper. Canvas limited to 50/50/15/5. Image Dimensions: Limited Edition Print Image size: 17" x 25.5" / Overall size: 23" x 30.5" Canvas Sizes: 18" x 27" , 21" x 32", 26" x 39" and 37" x 56". 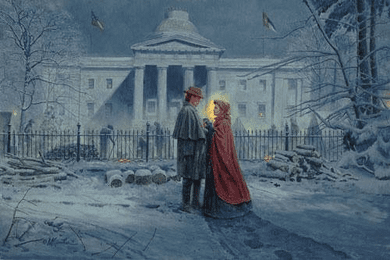 About the Edition : The 2013 Snow Print Release marks the 3rd of 8 final releases from Mort Künstler and his impending retirement to coincide with the 150th anniversary of the end of the civil war on April 9th, 2015. Like many Southern states, North Carolina's entrance into the American Civil War began at its Capitol. On May 20, 1861, state legislators signed the Ordinance of Secession in the House of Commons chamber. This officially ushered the Tar Heel State out of the Union and into the Confederacy. Following the final signature, a handkerchief was waved from the window of the office of the Speaker of the House announcing the state's secession to the crowd below. A great celebration erupted on the building's Union Square, including a 100-round artillery salute and music from a military band. According to a local legend, the first blood shed for North Carolina during the war occurred that day, as a bulldog, startled by a gun salute, severely bit one of the artilleryman of the First North Carolina Artillery, also known as Manly's Battery. For the next four years the building hosted the state's wartime legislatures. Although Governor Zebulon B. Vance maintained an office in the southwest suite on the first floor, the Capitol building served the war effort far beyond a meeting place for politicians. It was also used as a supply depot and a gathering place for the ladies of the town who met in the rotunda to fashion uniforms, haversacks and bandages. Confederate troops were brought to the capital city for training and then sent to the front lines. They often used the Capitol's surroundings for encampments. The building itself became a fixture in the hearts and minds of the soldiers and civilians who busily occupied its halls and grounds. In April of 1865 Raleigh and the Capitol witnessed the war firsthand as General William T. Sherman's army, led by Judson Kilpatrick's Third Cavalry Division, marched into town and began the occupation of the city by Federal forces. According to the North Carolina Office of Archives and History, "The Capitol itself was spared the total destruction that had befallen the old statehouse in Columbia, South Carolina. Before retreating westward, Governor Vance sent a peace delegation, led by former Governors David L. Swain and William A. Graham, to Sherman asking that the Capitol, with its library and museum, be spared. As a result, the Capitol suffered little damage." Despite a reprieve from excessive destruction, North Carolina's official copy of the Bill of Rights was stolen by an Ohio soldier. That document would not be returned to the state until 2003, when it was surrendered to the North Carolina branch of the U.S. Marshal's Service. On April 14, 1865, General John A. Logan organized the Society of the Army of the Tennessee, one of the country's first post-war veteran's organizations, in the Treasurer's Office on the first floor. From then on, the North Carolina State Capitol in Raleigh became a place of healing as the residents of the city and state began to recover from the consequences of the war. In 1995, I had my first one-man exhibition of original paintings at the North Carolina Museum of History in Raleigh. This was a special event where I unveiled and signed limited edition prints of the painting Winter Riders. That release was a huge success and after eighteen years, I will be having another show at the museum with more than thirty originals and another unveiling and print signing. What a pleasure this is for me, as my work continues to go full circle. With high hopes of repeating the wonderful reception of years ago, I decided to reprise some of the same elements in this new painting, Capitol Farewell. I always love painting snow scenes, particularly those that take place at night. This always challenges me to play with light and shadow and use a wintery palette of colors. This chilly scene is set in front of the Capitol in Raleigh, as it was in the 1995 painting. This view is taken from the Hillsborough Street side on the very same night, February 5, 1863, just around the corner from where Winter Riders takes place. Of special note is that the iron fence that surrounded the Capitol grounds at that time was removed in 1899 and moved to the Raleigh City Cemetery, where it remains to this day. The Confederate Army used the grounds around the Capitol during the Civil War as an encampment. The First National flag and the North Carolina state flag fly over the building as a young couple say goodbye, perhaps for the last time. Scenes of this sort took place thousands of times all over the country, both North and South. They still take place today as loved ones bid our servicemen and women goodbye as they depart to fulfill their duty to country. I have attempted to capture the drama of the moment, as well as show the difficulties of the soldier's life even hundreds of miles behind the lines. This scene is one that depicts both romance and fortitude. Accumulating a vast amount of information over the years of my many visits to the sites in my paintings has truly been a wonderful education, as well as a pleasure. I hope I have been able to pass some of this knowledge on to you, the viewer, as I paint the last few paintings of my Civil War career. It has been a great privilege for me to capture so many moments that led to the reunification of our country. By the time I complete a painting, I feel as though I know these characters and I hope that you feel the same way, too. No thank you, I just want the 17x27 AP unframed print.